Building relationships between children and adults who care and can impact their lives in a positive way. Exploration of artistic interests like music, dance, craft and other games. T he after school program has as its main objectives to improve upon the word and sound building skills of both class five and class six pupils. 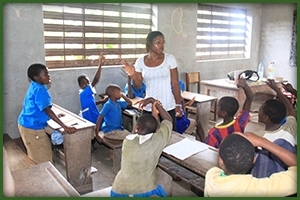 The after school program is carried out in three schools namely; Presbyterian School Buea Town, Government School Bonduma group one and Government School Bonduma group two. 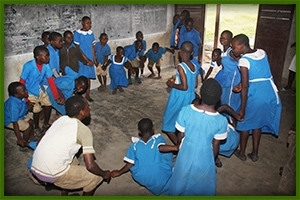 In Presbyterian School Buea Town there are 36 pupils, 20 pupils in class six and 16 pupils in class five. In both the First School Leaving certificate and common entrance examinations, they scored 100% and 14 pupils were promoted from class five to class six. 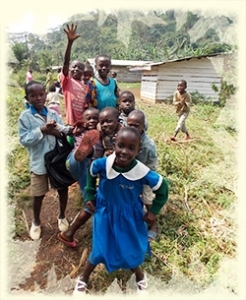 In Government School Bonduma group one there are 36 pupils, with 19 pupils in class six and 17 pupils in class five. 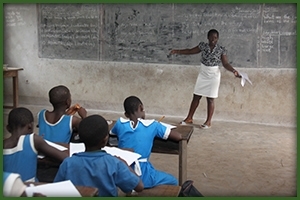 In both the First School Leaving certificate and common entrance examinations, 17 pupils passed and in class five, 13 pupils were promoted to class six. In Government School Bonduma group two there are 40 pupils, with 25 in class six and 15 in class five. In both the First School Leaving certificate and common entrance examinations, they scored 100% and 10 pupils were promoted from class five to class six. There are three facilitators in the program, and we try as much as possible to teach the learners how to read, write, spell and pronounce words. The facilitators started teaching letters and sounds of the alphabet because; they had discovered in the previous years that the pupils were unable to identify the letters and sounds of the alphabet which are necessary elements for reading and writing. To conclude, the program has created a remarkable improvement in the performance of the learners as some of them can differentiate between vowels and consonant sounds, associate sounds to objects and pronounce two, three and four letter words. Also, some of the pupils who succeeded to move to the secondary school still come around to seek advice and guide as concerns academic issues.